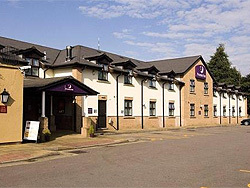 The Premier Inn Cardiff West is situated next to the Walston Castle Beefeater pub/restaurant, on the Port Road. The Port Road is the main road leading to the airport, and this hotel is located approximately half-way between Cardiff city centre and Cardiff International Airport. The hotel provides free on-site car parking for guests and has WiFi Internet access available (for a small fee). Walston Castle Beefeater pub/restaurant next door. Guest rooms feature comfy beds, en suite bathroom and remote control TV. Tea and coffee making facilities in room. Located on the main road to Cardiff International Airport.